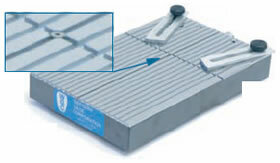 provide a rapid way to check slot widths, distance between valve spool lands. 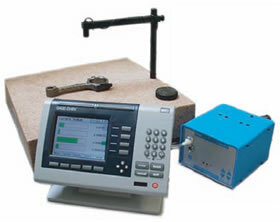 Flatness Gage has air jet incorporated in granite surface plate. Sizes available from 12″ to 36″ square. Optional overhead laser pointer spots gaging nozzle location when test piece is in place. Air Flatness Gage incorporated in tool steel reference flat. Detail view shows air jet imbedded in serrated flat. Adjustable Air Thickness Gage Detail view shows the lower air jet. Models with larger anvils are available. 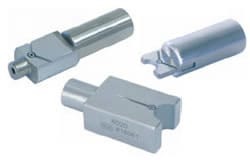 Open Jet Gaging Cartridges are used with Flatness and Thickness gages and similar applications. (See illustrations below). 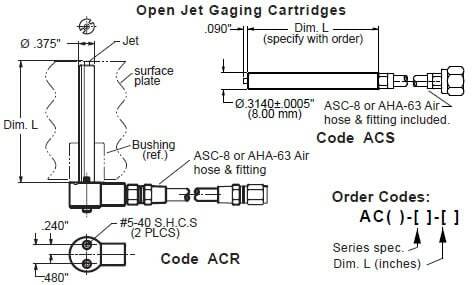 Model ACR has right angle hose connection and mounting screws for installation in surface plates. (Requires drilling the plate and installing a bushing). 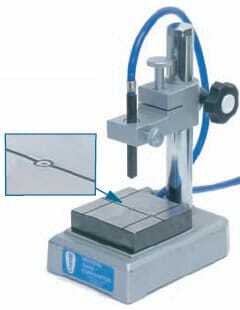 Model ACS is used on thickness gages and similar applications.